click photo to enlarge This picture is of the Mormon Rooks. 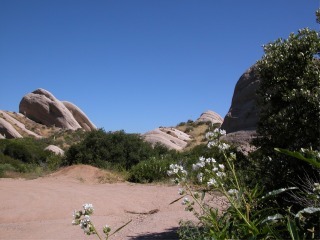 The rock formations are along the San Andres Fault in the Cajon Pass. They were formed along the fault line by sedimentary rock being pushed up out of the soil. They came to be called Mormon rocks because when the Mormon wagon trains left Salt Lake City they set up camp here before later moving on and founding San Bernardino. 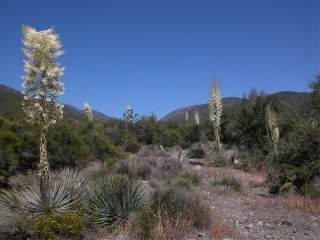 click photo to enlarge The rest of the pictures on this page are along Lone Pine Canyon on the way up to Wrightwood CA. click photo to enlarge These are taken in late May. We had visitors in from out of town and I wanted to accomplish 2 things. 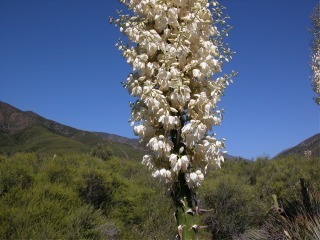 I wanted them to see one of the mountain towns in the area and also see the Yuccas in bloom. 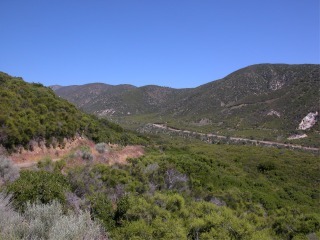 click photo to enlarge Lone Pine Canyon answers both these needs. 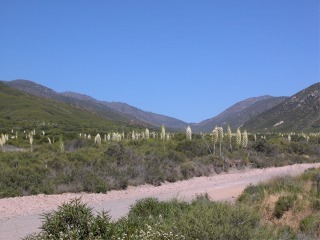 It is a fairly straight road for going up into the mountains and it also has the largest concentration of Yuccas I have ever seen. click photo to enlarge Of course I also took them off road on some of the dirt roads in the area. We ended up in Wrightwood.